A 32-year-old driver for the rideshare service Uber was arrested on suspicion of kidnapping a woman and taking her to a motel room, police said on Tuesday. Frederick Dencer, 32, of Encino, was arrested on suspicion of kidnap for purpose of sexual assault, police said. He was being held in connection with the incident, reported Monday at 6 a.m. A woman said she had just left a motel room where a man she did not know was lying next to her with his shirt off, said LAPD Lt. Paul Vernon. She didn't know how she got there. An Uber spokesman said the company learned of the incident through the media, suspended the driver's account and are cooperating with police. 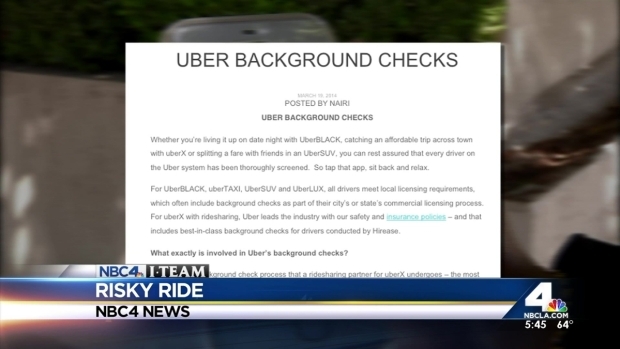 A months-long NBC4 I-Team investigation uncovered some dark truths behind UberX drivers, including convicted felons passing background checks and drivers stealing customers' belongings. Joel Grover reports for the NBC4 News at 11 p.m. Thursday, April 24, 2014. "The facts are unknown at this stage and it's certainly unclear that this is an Uber-related incident, as the driver in question was not logged in, connected to or operating on the platform at the time," said Lane Kasselman, a spokesman with Uber. "Nothing is more important to Uber than the safety of our riders." The case came to light after the woman had woken up in a low-rent motel after a night of bar-hopping in West Los Angeles, police determined. In light of an ITeam investigation on Uber X, LAX Police say they too have an ongoing problem with Uber X drivers at the airport including drivers with criminal records. Joel Grover reports for the NBC4 News at 5 p.m. on Friday April 25, 2014. Vernon said the driver was offered a fare from a valet at a nightclub. The fare was not assigned from Uber, he said. Detectives believe the woman's ride was not arranged officially through Uber, Vernon said. Had this been an official Uber assignment, Dencer would have received the victim's home address with the fare, but in this case, the victim was too drunk to tell him. The investigation led to the Panorama Motel, where detectives found Dencer in a room, Vernon said. "Dencer answered questions but his story didn't make sense," Vernon said. "So it looks like Dencer took advantage of the situation, and drove her to a cheap motel, which he had visited before, and carried her into the room." He slept overnight in the room, and when the woman woke up, he let her leave, though he asked her to stay, Vernon said. "He took advantage of where he was at, what he was doing and saw an opportunity," Vernon said. It was not immediately clear if the suspect had a lawyer.